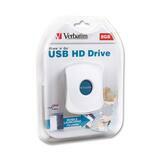 Here are specifications for the Verbatim Store ‘n’ Go USB hard drive. It contains a 1″ hard drive and operates on a USB. Perfect for travelling! I am considering one for my next trip. As small hard drives and large flash drives approach each other in price and capacity, speed becomes a major determining factor. This information and more is available on the European Verbatim web site, which is much more informative than the North American web site. It took a lot of time and effort to find the specifications. I am deciding what bulk storage media I should bring with me on my next trip to store digital photographs. The idea is to bring the USB cable for my camera and a small USB hub so I can transfer photos from the camera to the storage media. Last year I tried uploading photos to my server, but transfer speeds are very slow, and it was impossible to keep the backup current. I ended up burning CDs instead. CDs are cheaper and lighter. Weight is important because I will be carrying everything I own in a backpack. USB Flash drives are very light and compact, but get expensive at higher capacities. They are also rather slow (but not so slow as to be a problem). This Verbatim 8GB hard drive is about 50% more expensive than a 2GB flash memory, and about 8 to 12 times faster (write speed, which is slower than read speed for a flash drive by about a factor of 2, depending on the model).